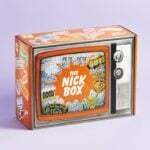 Check out the latest The Nick Box Reviews on My Subscription Addiction! "Great idea for a box! It's kind of similar to the perfume kits that Sephora does." "Thanks for reminding me to check on my Glossy credits. I have $9.50 in credits :D Now I am even more excited fo..."
"What a great idea to send samples so you can choose! I wish happy rebel had done something similar since the sme..."